German Chancellor Angela Merkel speaks during a general debate in the lower house of parliament, the Bundestag, in Berlin, Germany. 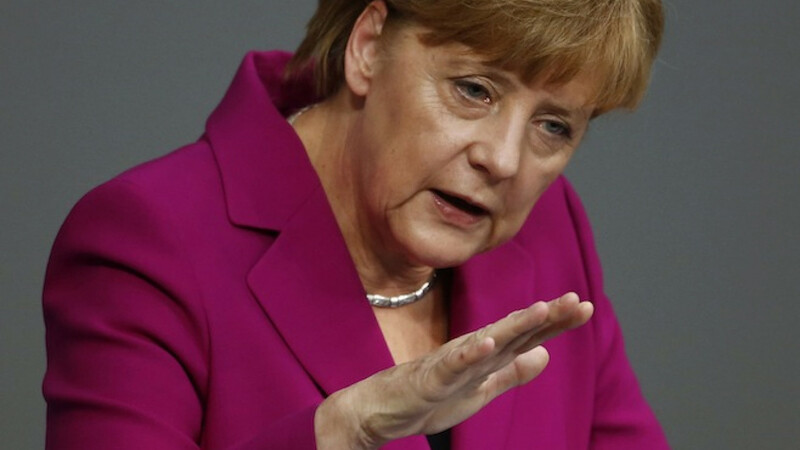 German Chancellor Angela Merkel spoke to Russian President Vladimir Putin for the second time in two days on Thursday to discuss how to help resolve the crisis in eastern Ukraine, the Kremlin said. The call took place "at the initiative of the German side" and touched on questions of "monitoring observance of the ceasefire between the sides in conflict, the necessity of extending the truce, the establishment of regular work by the contact group, and the freeing of people being forcibly detained", the Kremlin said. A German government spokesman confirmed that the call had taken place, with the aim of finding a way to prolong the Ukrainian government's ceasefire, which is due to expire Friday at 10 p.m. local time. Interfax said Ukrainian rebels had agreed to take part in further peace talks in Donetsk on Friday. U.S. Secretary of State John Kerry said Thursday in Paris that it was "critical for Russia to show in the next hours, literally, that they're moving to help disarm the separatists, to encourage them to disarm … and to begin to become part of a legitimate process". Ukrainian President Petro Poroshenko has suggested that he expected a repeat of a four-way call on Wednesday in which he and French President Francois Hollande joined Merkel and Putin. Western powers have been pressing Putin to rein in the well-equipped but often disunited Russian-speaking militant groups who have taken up arms against the Kiev government, and have threatened to impose more sanctions if he fails to do so. Putin strenuously denies equipping or abetting the rebels, but has made clear that he sees himself as the defender of the Russian-speaking minority in the industrial east, many of whom say they have been alienated by a wave of nationalism since former Ukrainian president Viktor Yanukovych was toppled in February. Putin also drew Merkel's attention to the worsening humanitarian situation in eastern Ukraine, where some areas have no power or water, and to the flow of refugees to Russian territory — 40,000 of Russia says have been put into dedicated shelters. Some of the main rebel groups agreed on Monday to hold their fire until Friday morning, in a meeting attended by former Ukrainian President Leonid Kuchma as well as representatives of Russia and the Organization on Security and Cooperation in Europe. However, there has been no indication that this "contact group" has met again, while dozens of breaches of the ceasefire, including the shooting down of a helicopter, have put pressure on Poroshenko to call the ceasefire off. Kuchma on Thursday pressed for another meeting of the contact group soon, Interfax reported. "At a time when the three-way contact group is ready to find a way to secure peace, consultations have not begun, no signals have come from the other [rebel[ side," he said. Sources close to Viktor Medvedchuk, a leader of the pro-Russian lobby in Ukrainian politics who took part in Monday's talks, said, however, that the "contact group" was likely to meet again on Friday.